1 Ep. Ind., XIV, pp. 331 ff. 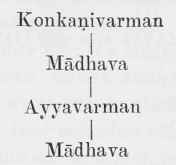 In regard to the first two there is nothing worthy of note except that according to other records of this dynasty Konkani-Varman had the name Madhava and was the uncle of the other Madhava rather than the father. This difference may be explained on the ground that the table given here is a list of succession not necessarily from father to son. Ayya-varman may be Ariyavarman, and may be synonymous with Ari-Varman and Hari-Varman, and even possibly with Krishnavarman as Mr. Rice suggests. What is of peculiar importance in regard to him in connection with the Pallavas is that he was installed by a Maharajah Simha-varman, "the Indra of the Pallava kula" 'in a literal sense' (yathartham). His successor, according to this record, Madhava, had the alternative name Simhavarman, and he is said to have been similarly installed 'in the literal sense' by Maharaja Skandavarman of the Pallavas. According to the other records of these Gangas however a Vishnugopa comes after Ayyavarman. Mr. Rice who is the editor of the Penukonda plates finds it possible that there is an omission of the name in these plates by the fault of the engraver. It seems likely however from the unanimity of the records in respect of this ruler Vishnugopa, that a ruler by name Vishnugopa, did precede Madhava, the last of the name in this pedigree, whether he was the latter's father or grandfather; or there is still the possibility that he might have been an uncle for which assumption there is no authority in any of the records. The fact that Simhavarman installed Ayyavarman and that he was followed by a ruler with the name Vishnugopa, and that this Vishnugopa was followed by a ruler who was installed by a Pallava Skanda Varman seem to imply a Pallava overlordship over the Gangas. If as suggested above Vishnugopa, happened to be an uncle or granduncle of Madhava the name Simhavarman given to Madhava would be an honour done to Simhavarman who installed Ayyavarman on the throne. There is therefore reference to a Pallava ruler Simhavarman who must have had a successor following, either immediately or in the next generation, by name Skandavarman with just the possibility that the Vishnugopa of the Gangas was a name given to 24 the ruler in honour of a Vishnugopa, the Pallava overlord. If this possibility should turn out a fact then we have this Pallava succession: Simha-varman, Vishnugopa and Skandavarman. According to the Udaiyendram grant we have had a succession Skandavarman, Simhavarman, another Skandavarman followed by a Nandivarman, and we have for good reasons regarded this Simhavarman as the son of Skandasishya, father of Yuvamaharaja Vishnugopa. The possibility of connection therefore between the Pallava sovereigns of the Penukonda plates and the succession list of the Pallavas we have arrived at seems clearly indicated to the period following the reign of Skandasishya or Skandavarman II; but the identification of the actual rulers is not thereby made easy. Simhavarman I, his younger brother Vishnugopa and Skandavarman the son of Simhavarman may be one set of names, if that is the order in which they ruled; for our present purpose it would quite do if Simhavarman was followed by Skanda Varman, Vishnugopa being a mere Yuvamaharaja. There is another alternative; the three names referred to may be Simhavarman II son of Yuvamaharaja Vishnugopa, his son Maharaja Vishnugopa of the Chura plates followed by the name Skandavarman, the son of Simhavarman I, if this had been the order of the Pallava succession. Whichever of the two alternatives should ultimately turn out correct the three Ganga rulers Ayya-varman, Vishnugopa and Madhava, the second or third of the name, must have ruled in the period between Skandasishya or Skandavarman II, and Simhavarman the father of Simhavishnu of the dynasty of the great Pallavas that, for good reasons, we have ascribed to the period A.D. 380 to A.D. 500. Even the approximate date of these rulers would depend entirely upon the arrangement of the Pallava order of succession. After Skandavarman II we might take it almost certain from the Uruvapalli plates that Simhavarman I succeeded the father, Vishnugopa being the Yuvamaharaja under him. If Vishnugopa did not rule Simhavarman was probably followed by Simhavarman II Skandavarman perhaps having been very young. It is also likely that he was followed by Vishnugopa II of the Chura plates, he in turn being succeeded by Skandavarman III; then must have followed the dynasty of the other son Kumara Vishnu I. If we can safely follow the Velur-palaiyam plates, Kumaravishnu must have been succeeded by Buddhavarman, Nandivarman following then. The fact however that the Velurpalaiyam plates speak of a host of rulers following Buddhavarman before Nandivarman at last succeeded would indicate that Simhavarman I was probably followed by Kumaravishnu; he by his son Buddhavarman perhaps followed for a short while by Kumaravishnu II. The succession perhaps passed then to Simha-vishnu II of the table; then Vishnugopa II; then Skandavarman III and lastly Nandivarman. We may accept this order of succession tentatively till we get more clear lead as to the actual order of succession of these. If we turn to the Vayalur plates for this lead it would be difficult to find any. Simhavarman the father of Simhavisbnu is preceded by Vishnugopa whom we might take to be the second of the name. He is preceded by a Simhavarman which is so far correct. He is preceded by another Simhavarman and the only Simhavarman available is Simhavarman I of the table. He is preceded by five namas 23 to 27 which are the names found in the Udaiyendram plates already referred to, of which No. 28, Simhavarman must be one. Nos. 15 to 22 seem difficult of adjustment on the table; some of the names are new and there is also confusion in the order. As was pointed out already this list seems to be a jumble of various genealogies collected and put together as the order of succession without a correct knowledge of the actual succession. It would there-fore be better to accept the arrangement last suggested namely Simhavarman the eldest son of Skandasishya being followed by Kumaravishnu I and then by Buddhavarman and perhaps even by Kumaravishnu II, the succession going back to the son and grandson of Vishnugopa I, and then on to a son and grandson of Simhavishnu. That will bring Simhavishnu, Vishnugopa and Skandavarman of the Penukonda plates late in the succession making the date A.D. 475 for the plates possible. It may even be somewhat later. Skandavarman was according to the Velurpalaiyamplates followed by Nandivarman; then comes in a break in the succession as far as our present knowledge of it goes. Then follows the line of Simhavarman, father of Simhavishnu; Nandivarman, Simhavarman, Simhavishnu and Mahendravar-man occupying almost a century, and perhaps a little more, between Simhavarman of the Penukonda plates and Narasimhavarman the great Pallava whose accession might be dated approximately about 600 A D.
Karikala, but the succession of political changes centering round his name and that of his successor for a generation or two at the lowest seems impossible.